Referred to as the bible of options books, The New Options Market has groomed two generations of traders and investors for success. Now with this updated and expanded Fourth Edition, Max Ansbacher gives his unique and tested strategies to you! With the help of numerous real-world illustrations, appendices with over thirty Web site suggestions for options traders, and specific advice on option picks, he explains the basics of trading theory and practice. 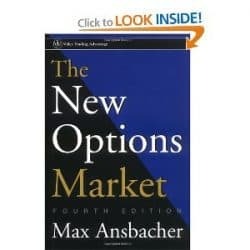 In easy-to-understand, nonmathematical language, The New Options Market, Fourth Edition, is a highly personal, and newly updated guide that is specifically aimed at options traders in need of knowledge that will lead them to success. “As a broker on the S & P options floor for the past eight years, I find that The New Options Market, unlike other option books, represents a clear, practical approach to trading options. Both the professional and the novice will benefit from the comprehensive coverage of all aspects of option trading.” -Kevin M. Maclean, V.P., Fimat, U.S.A.